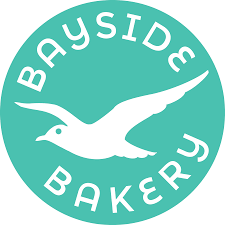 We first met Katy from the Bayside Bakery at the Honiton Show in 2017 and were taken by her Bayside Blondie brownies. Since then, we've regularly seen Katy at Bridport Market and shows across the region and often buy a little bite of brownie heaven to take back to the office with us. We started in April 2015, really by accident. I had worked a 12 hour shift and after a particularly difficult day, handed in my notice ending a 20 year career as a critical care nurse. All the way home I was thinking about what to do next. I’ve always loved to bake for family and friends and we had talked about having a bakery. This seemed like the right time. I got a market stall in Bridport and initially sold all types of cakes. I noticed that the brownies were selling out before anything else and was what people were asking for so one week I baked just a variety of brownies. They sold out. In those first months, I spent a lot of time delivering sample boxes locally and researching how I could do brownies by post. A month into the business, I entered the Taste of the West Awards and won gold! Having award winning brownies gave me the confidence that I was doing things right, as well as helping the business grow. Since then we have gone on to win another Gold and a Highly Commended award. What’s your favourite product and what makes you and your product special? I am always researching on Pinterest and Instagram for inspiration for new ideas and flavours and I’ve had lots of requests for salted caramel. I was convinced this was just a trendy flavour and would soon go out of fashion, however, I decided to bake some using local supplier, Dorset Sea Salt. After I tasted it, I realised this was my best one yet! This brownie is currently a limited edition though and has only just become available to buy and the response has been amazing. Its lovely to bake something using another local producers ingredients too so it really is a Dorset delicacy! From May to Christmas, I work around 12 hour days, 7 days a week, and demand increases from the cafes we supply during school holidays. I have two ovens and two mixers and make 80-90 brownies per batch. Last year we built a dedicated bakery extension on the back of the house and Andy has made a wonderful cooling larder for me so when the trays come out the oven, they slide straight in, which is a great help. At my busiest, with Andy working alongside me, we make 500 brownies in a day but that’s flat out. Wrapping the brownies so they look their best is really important to us. We want the opening of the gift box to be a real treat as well as the brownies inside. At Christmas wrapping what we have baked can take a whole day. Our biggest and by far the most successful event is the Dorset County Show, but if I have to choose favourites it would be the Symondsbury Estate Christmas Fair and the Bridport Food Festival. We do whatever it takes to supply our customers, who are really important to us. If someone has missed an order deadline to get brownies to someone for a birthday present, we will bake and run to the post office to get the order posted! 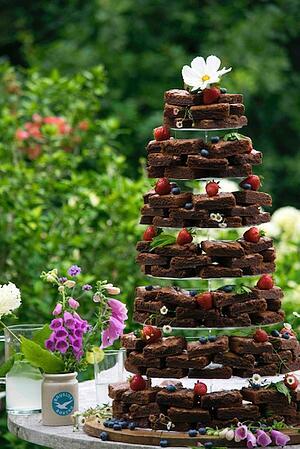 Last week, a dessert bar in Devon we supply rang me as they had run out of brownies. I made the decision to miss Bridport Market to make the delivery to Devon instead. When I came back on Saturday, all my regular customers complained! Keeping things to myself! Last year I was invited to send large quantities to a well-known London address but was unable to tell anyone about it! However, I can say I have posted my brownies to all sorts of important addresses, including Beverly Hills 90210! My salted caramel brownies are definitely a success so I’m glad that I decided to make them. I create all my recipes myself, so coming up with new flavours is always exciting. Social Media was a steep learning curve for me, and I’ve learned how important it is to keep things fresh and post pictures of my products. I see Instagram as being about our lifestyle and not just our business and often post about the family and time spent on our allotment just up the road. It gives the business a real face! The biggest challenge of all has to be keeping up with demand. The business has grown so rapidly that we constantly have to come up with new ways to streamline the baking and the running of the business. At Christmas, I made brownie mix jars, with all the ingredients measured out so that anyone could make them. I’m thinking about expanding this line. I also want to do more weddings and events: I create beautifully decorated brownie towers which really have the wow factor. Also, corporate orders is another area we’d like to focus on more. Last year there was a significant demand from businesses wanting to send my brownies to clients and I see this business growing every year. What is the best thing about living in Dorset? We came down from Hampshire and London in 2006. We’d looked around and decided Dorset was where we wanted to be. It is a spectacularly beautiful county with so much to offer and we immediately felt settled and at home after we bought our house in Loders, Bridport. Why not stop by Bridport Market on a Wednesday morning and treat yourself to one of Katy's creations?